Internationally known for his prominent role in Iranian Revolutionary politics, Mir-Hossein Mousavi is also a visual artist and architect. During the 1960s, he studied architecture at Melli University. In the 1960s and ’70s, his architectural drawings and paintings were regularly exhibited at Ghandriz Gallery, which showcased the work of young artists experimenting with abstraction. At the same time, Mousavi was rising in the ranks of the Islamic Republic Party. After the 1979 Revolution, he edited the party’s official newspaper. From 1981 to 1989, he served as the 79th and final Prime Minister of Iran, leading the country through the Iran-Iraq war. He then returned to architecture, becoming President of the Iranian Academy of Arts and designing major buildings in Tehran and Shiraz—as well as to painting and writing poetry, teaching at several universities, and participating in numerous exhibitions. In 2009, Mousavi came out of semi-retirement to run as a Reformist candidate against President Mahmoud Ahmadinejad but lost the election. Allegations of vote rigging sparked extended protests that inspired him to co-found the Green Movement, which opposes the current government. Mousavi made the gouache on view here, Musical Notations,, when he was 25 years old. 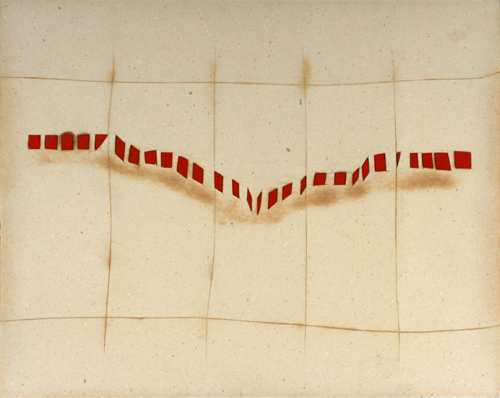 His deft handling of the sinuous march of red musical notes against a loosely incised grid demonstrates his attention to current trends in Western art—from American Minimalism and the musical theories of John Cage to European serial composition inspired by twelve-tone scores, as seen in works by Jesus Soto and his contemporaries. Musical Notations also reflects Mousavi’s absorption in the Iranian perspective—mined by numerous artists in the present exhibition—that calligraphy, visual art, architecture, music, and poetry are fundamentally linked. Dimensions 27 3/4 x 35 1/4 in.